I'm about to go get my Fergie on and work on my fitness, so I thought I'd write a quick blog about some fun fitness accessories! Want to put a little "pep" in your step? 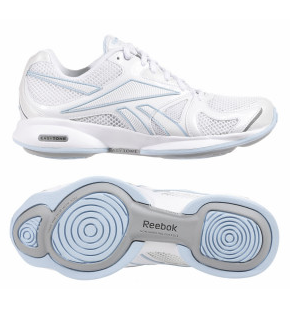 Reebok has taken this saying to literal terms with their new EasyTone shoes for women. They are like any other pair of tennis shoes except EasyTone comes with balancing pads on the bottom, which they say creates a "natural instability" thus makes you have to adjust, working various parts of your legs to tone them while you're shopping, walking to class, taking the dog out for a run, etc. They come in a variety of colors and let me correct myself - they're not just tennis shoes, they come in athletic flip flops as well! I can't work out unless I have some comfy clothes to wear, which is why I LOVE lululemon athletica. I stumbled upon this place two years ago when my fabulous Aunt Deb took my shopping and although it was a complete accident I bought a wonderful staple item for my wardrobe: the workout hoodie. This thing feels like it was made by God himself because I can wash it a million times and it still remains soft and comfy. After that one trip I became obsessed and love their yoga pants and shorts. If you're wanting to eat healthy but you're on the go, visit Moveable Tweets on Twitter to find a healthy lunch truck near you. It will take a little preparation but should pay off during lunchtime. Here's a link for a small list of usernames on twitter to follow (including LA! For you Texas readers, you'll have to search).